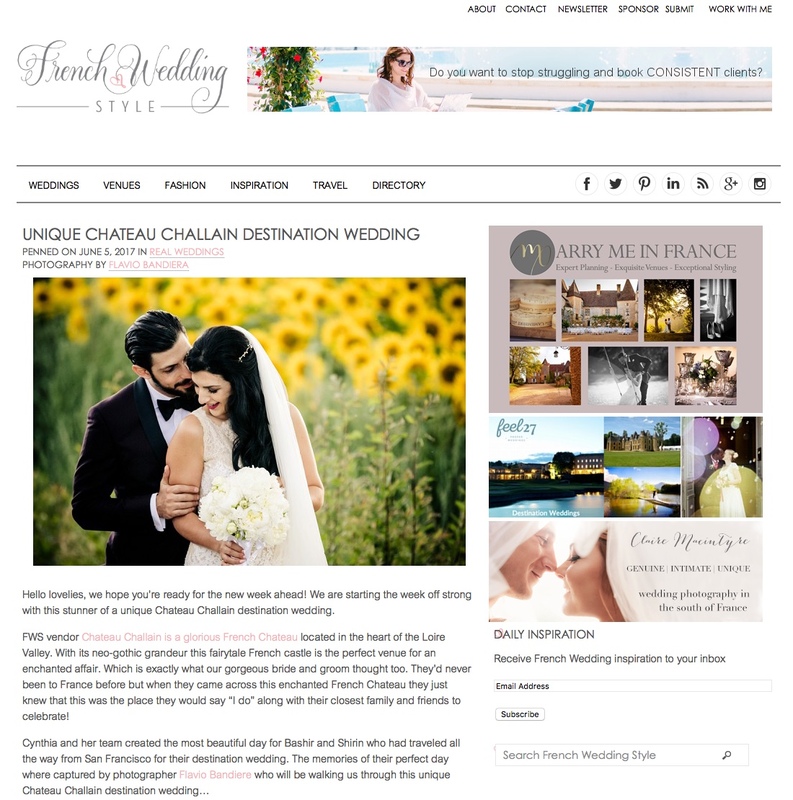 French Wedding Style is one of the most awarded European blogs specialized in analysing wedding fashion and trends in France and in June 2017 published Bashir and Shirin’s wedding, which I photographed a few months earlier in Loire. Bachir and Shirin, they were both charming, positive and extremely communicative, and they have allowed me to make a reportage without any style influence: they simply asked me to guide them through their wedding day and to shoot what I mostly preferred. The location they chose is the magnificent castle Chateau Challain(France) and the spouses and their guests are Americans, more precisely from San Francisco. The religious rite, an original one indeed, typical of Persian culture, was held on a bridge over a river inside the property, where the festivities were celebrated shortly after. The weather was magnificent, and so were the guests’ clothes and the atmosphere that was around: all this made the entire programme perfect. Everything was flawless also thanks to the attention to detail of Cynthia Nicholson and of her staff. Shirin wore a Pronovias dress and Christian Louboutin shoes, while Bachir decided to wear a Ted Baker suit and Hugo Boss shoes. The amazing cake was made by Dealicious Gateaux of Chateau Challain. On French Wedding Style You can read the entire article that deepens the story Bachir and Shirin, and you can also see some of the photos I took during the unforgettable day that I spent with them.